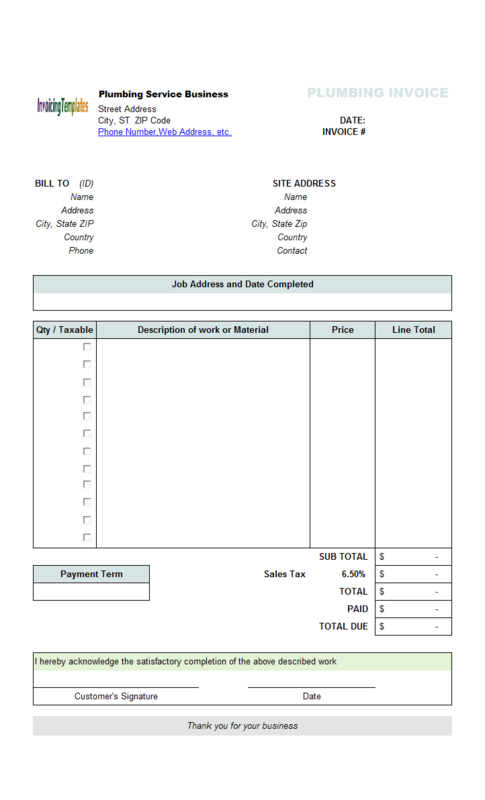 Plumbing Service Billing Template (Landscape), as the name implies, is a customization sample of Plumbing Service Billing Template (Sales Tax) (c4022). 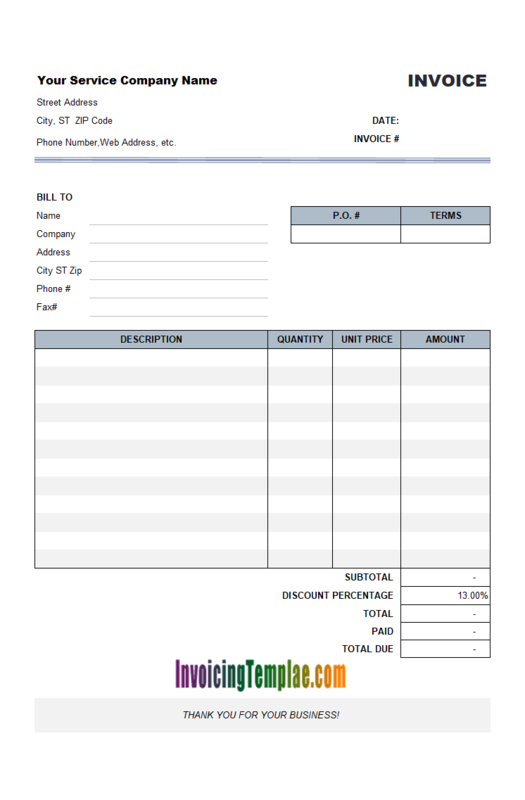 This sample invoice layout changed the original paper orientation to Landscape. It contains less lines on the detail section, but each line is able to hold more text. 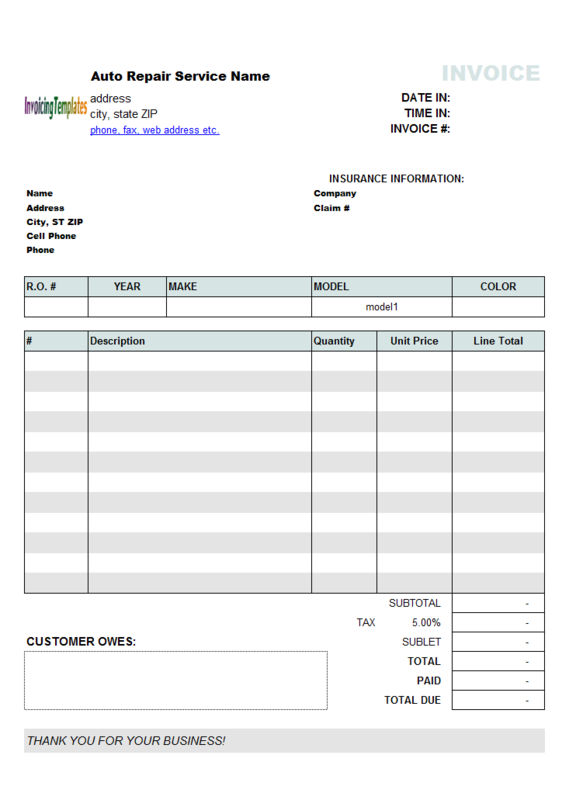 c4023 now includes the customized invoice template for the latest version of Invoice Manager for Excel. 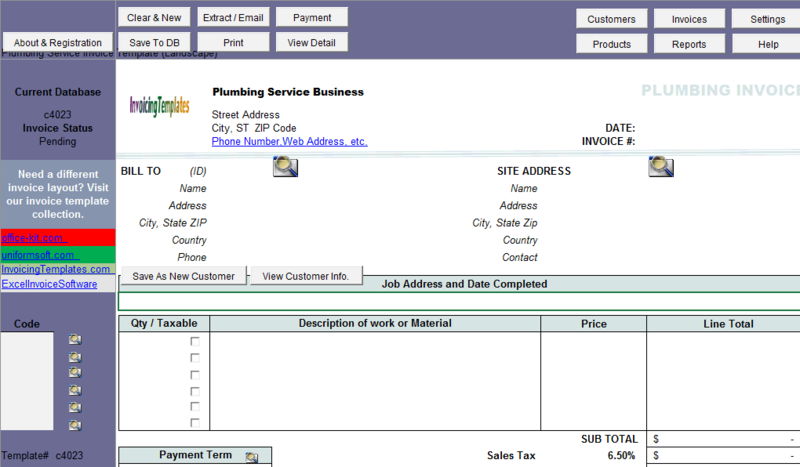 This is what you will see when you open plumbingserviceinvoicetemplate2.xlsx. 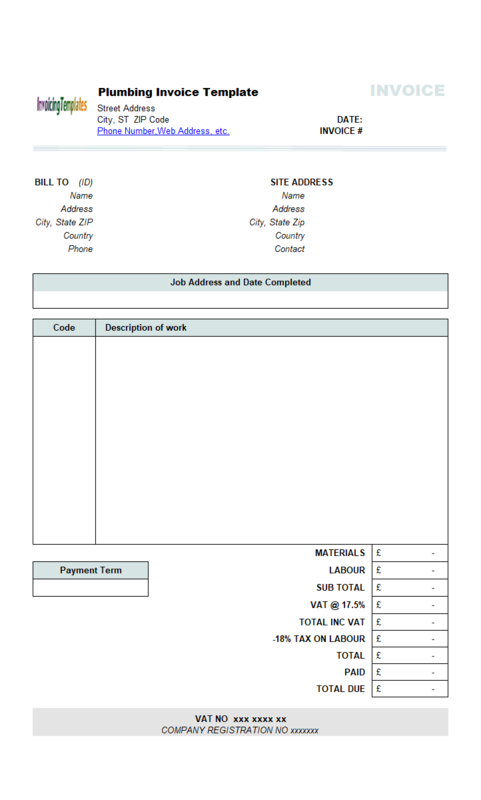 Plumbing Service Billing Template (Landscape) includes exactly the same number of fields as the original version. 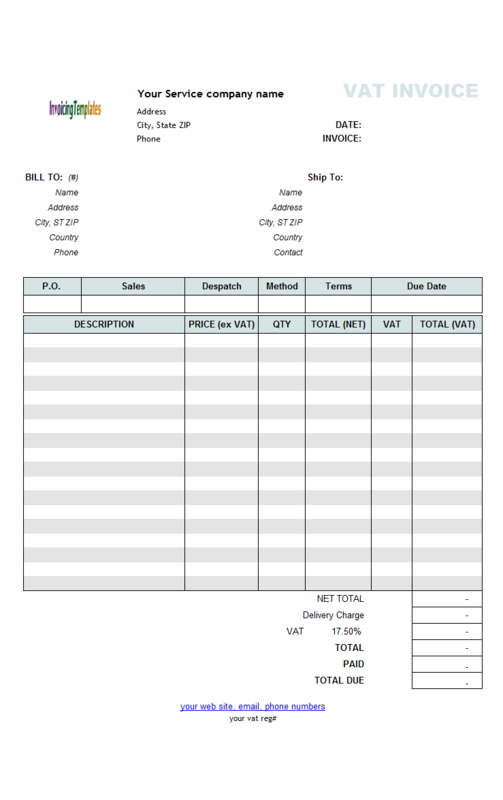 Unlike the other 2-column samples, Plumbing Contractor Bill Sample (c2008) and Plumbing Contractor Billing Format (Landscape) (c2009), this plumber template defines sales tax, instead of VAT tax. 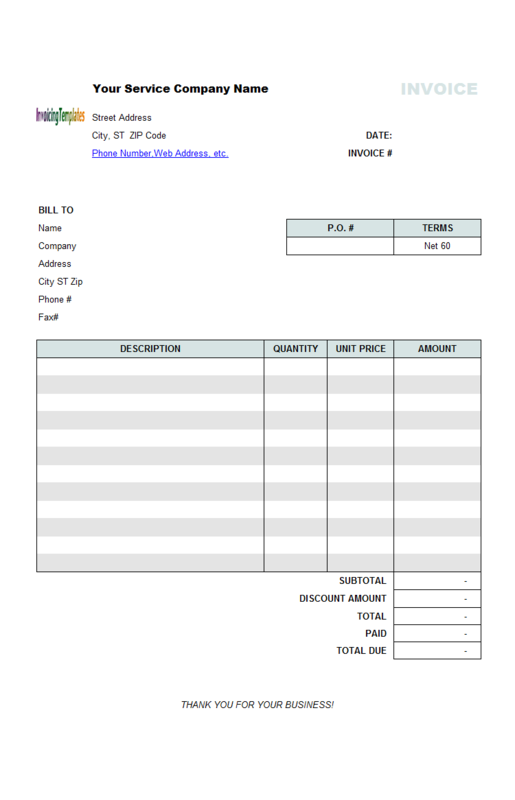 Like Plumbing Service Billing Format (Sales Tax) (c4022), this service template for plumber also has the Taxable column moved into the printable invoice form. This layout design is suitable for those businesses who have both taxable and non-taxable items. 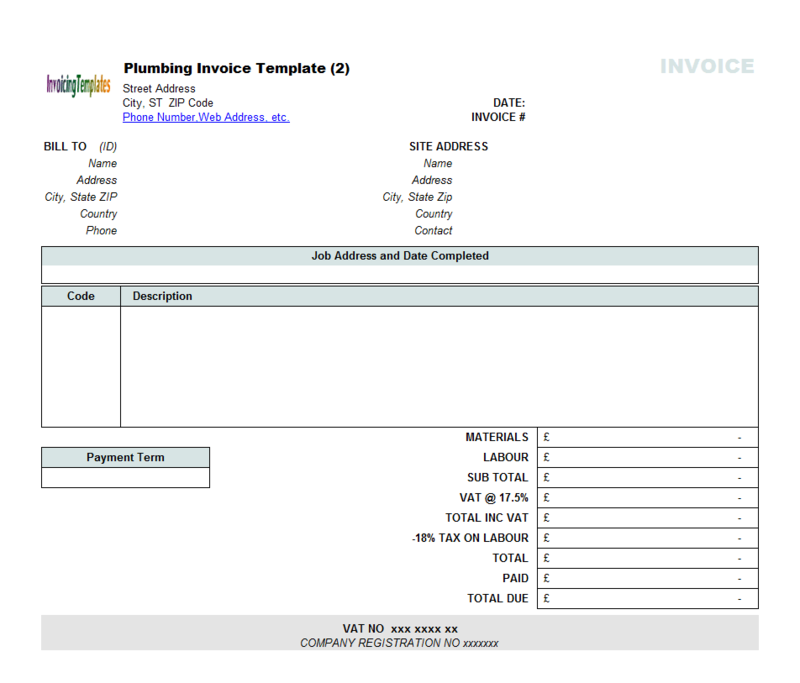 Bill your customers with this plumbing bill design if you have relatively long description for your invoicing items. 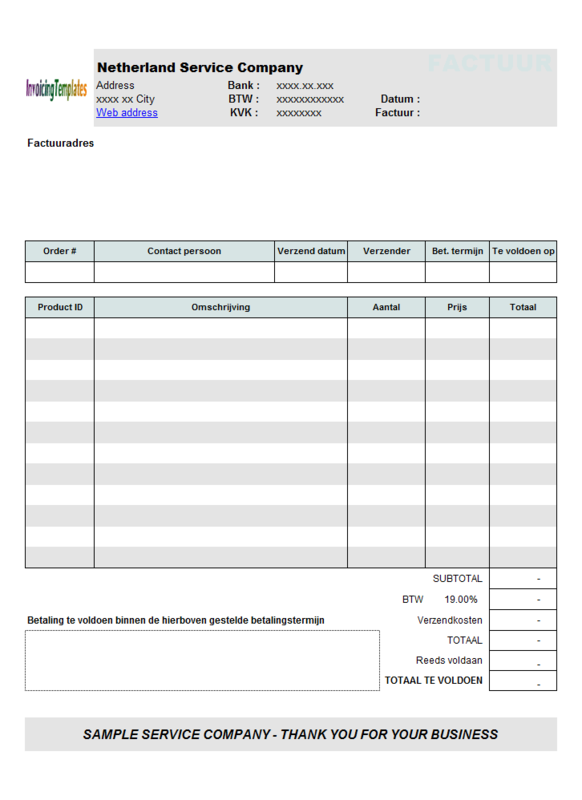 Checkboxes can not only be used as in a column value, but also could be on the invoice header and invoice bottom. 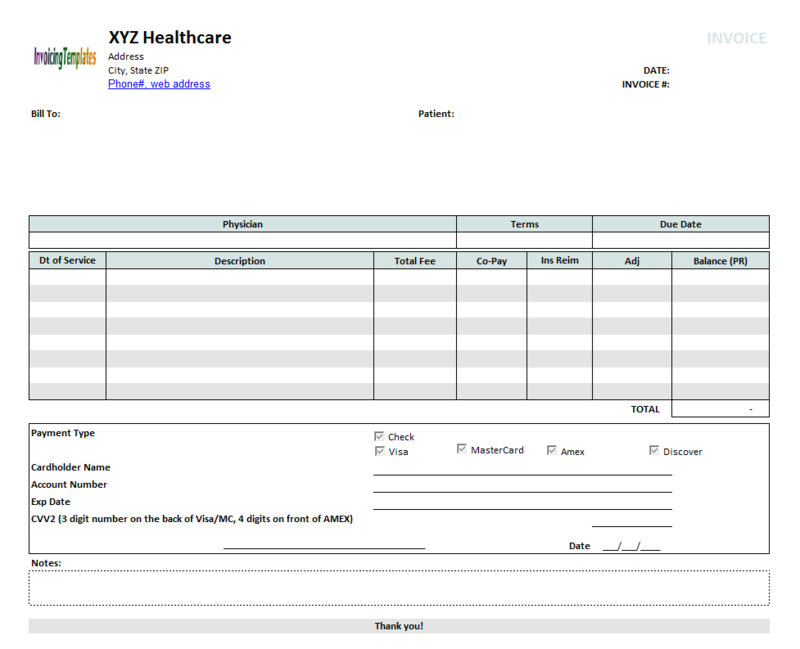 For another example of using checkboxes, refer to Medical Bill Sample (1) and Medical Bill Design (2). 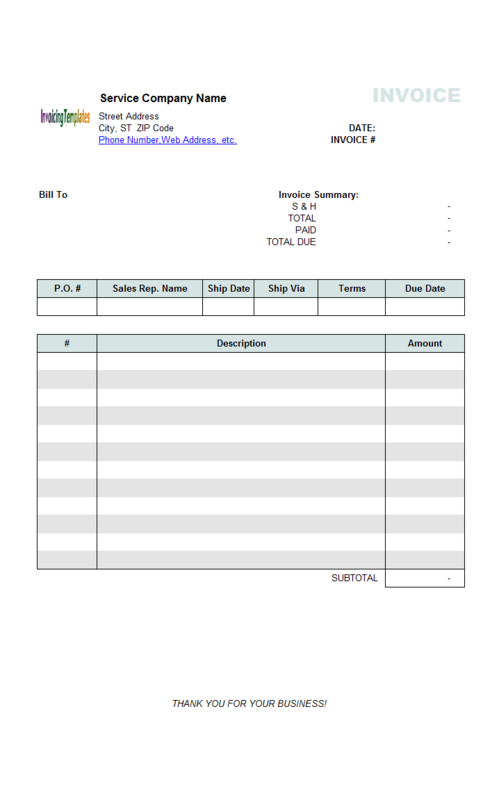 One thing to note for the Invoice Manager for Excel (namely Uniform Invoice Software) version is that, if you extract an invoice, the taxable checkboxes will be kept on the extracted version. This is implemented by naming the checkboxes with "oknWidget_" prefix. All the other objects that don't have "oknWidget_" prefix in their names, like the command buttons on the plumbing service invoice form, will be deleted when being extracted. 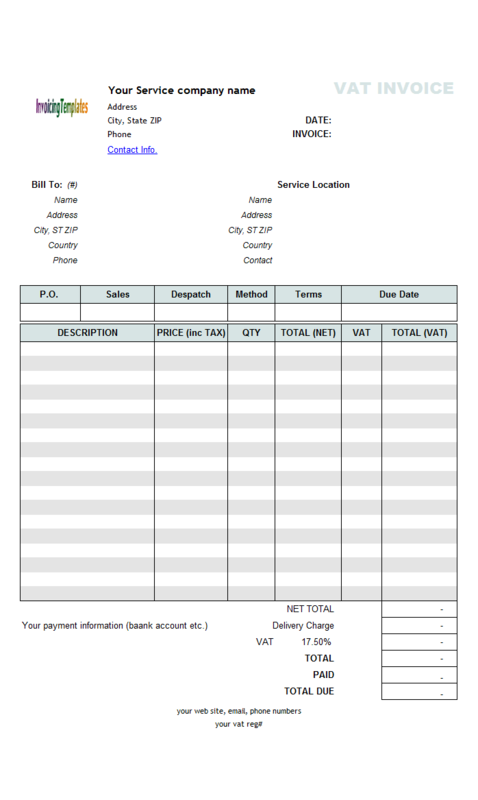 Please go to the download page to download the Plumbing Service Bill Sample (Landscape) in the format you like. 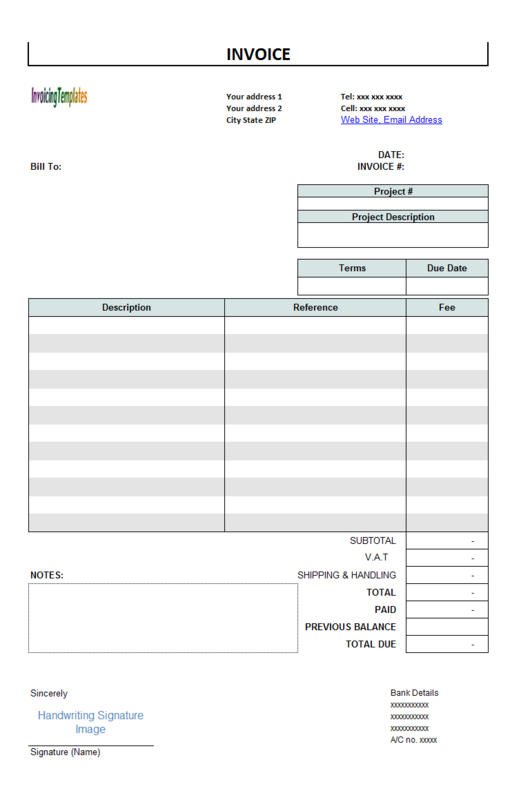 If you are interested in the implementation details of Plumbing Service Billing Template (Landscape), read on. 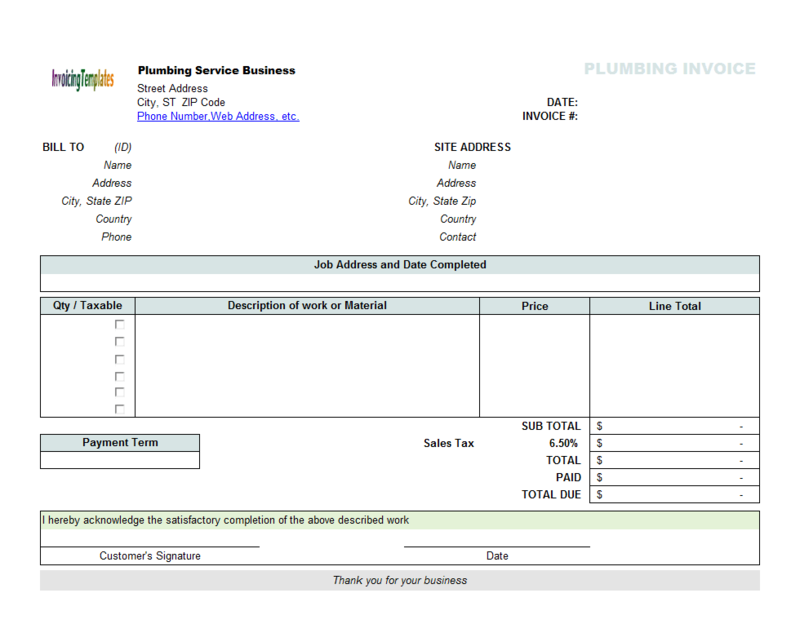 Like most free Excel templates available here on InvoicingTemplate.com, this plumbing service bill sample (Landscape) has a logo image on the top-left corner. You should replace it with your own image before you can use the template for your own business. 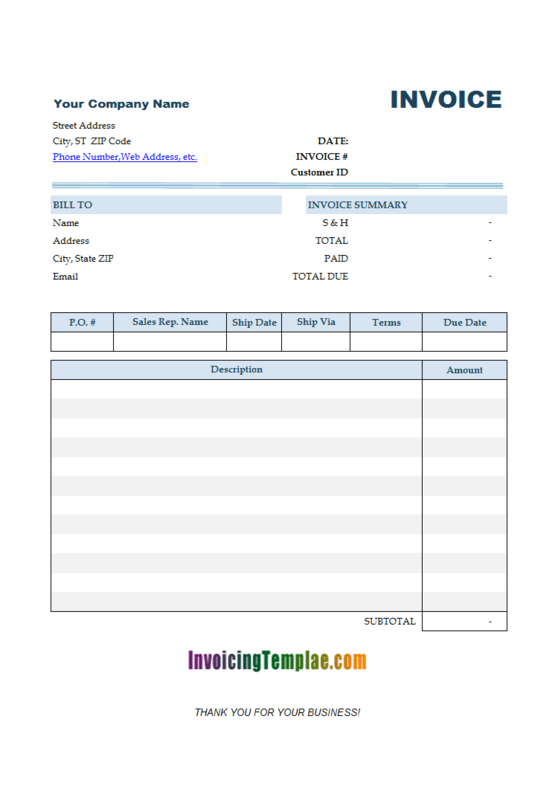 This template uses custom fields that are not defined in the default database shipped with Invoice Manager for Excel (namely Uniform Invoice Software). For example, underneath the "Bill To" section there is an oknJobAddress cell, which is a custom field. 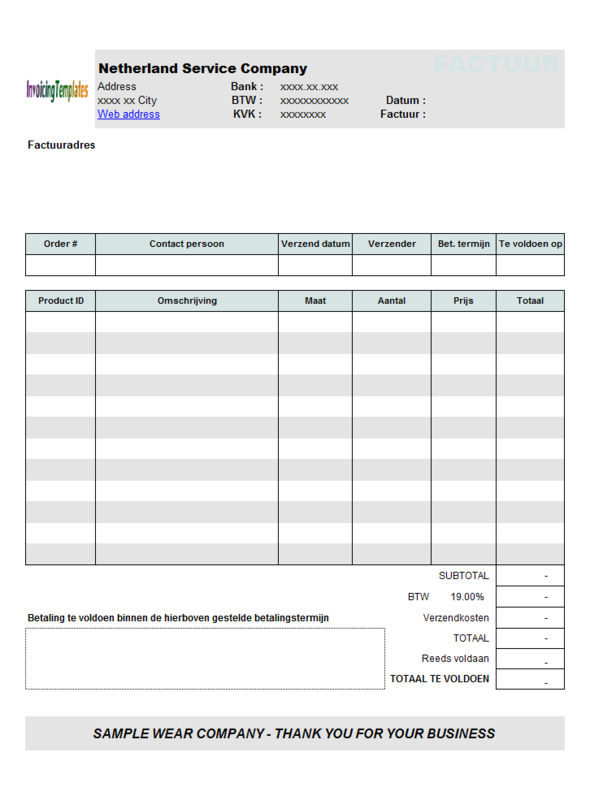 Like other form designs here on InvoicingTemplate.com, Plumbing Service Billing Template (Landscape) is free (offered to you at a price of 0.00USD). It works on Windows XP and all newer versions of Windows, and Excel 2007, 2010, 2013 or 2016.